I am cautious about relying upon an author's correspondence as any sort of "key" to the author's fiction. Consider, for example, Flannery O'Connor's letters, which have become quite a popular resource but showcase a personality that is sometimes very much at odds with the narrative persona in O'Connor's her fiction; a reader of O'Connor's fiction must be wary of conflating the narrator with the correspondent. Do you find a similar hazard in Bellow's writings? I just discovered your blog through the excellent "Cancer Etiquette" posting, and I've begun reading through your essays. My apologies if you've already addressed this, but in relation to "Rather late in life, Bellow wrote to Cynthia Ozick, wondering how it happened that “Jewish Writers in America”—a category that he calls “repulsive”—should have overlooked “the central event of their time, the destruction of European Jewry,” and your essay "Michael Chabon's Imaginary Jews" (great opening line here about the collected tweets, by the way), I wonder what thoughts you might have about Bellow's profound engagement with the Jewish experience as background experience for his literature, as opposed to what appears to be Chabon's disengaged, appropriation of it for novelistic purposes. Specifically I have in mind Chabon's "Chosen, Not Special" New York Times piece, June 5, 2010. Have you addressed this elsewhere? 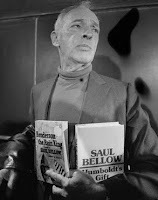 The quotes in your post implies that "the destruction of European Jewry" was a part of Bellow's makeup, regardless of whether he wished to be explicit about it - excellent literature itself is the argument - while in Chabon you have a writer feeling the need to state to everyone, "This is why, to a Jew, it always comes as a shock to encounter stupid Jews," or "Jews are stupid in roughly the same proportion as all the world’s people", the point, apparently, of his piece. Jewish people are taught that they're smarter than everyone, but then as they get older they discover that apparently this might not be true, and as a result, this kind of uncanniness makes for quite some great literature, as the work of Philip Roth attests, Chabon argues. As long as there's a good metaphor to make the point, "A stupid Jew is like a hole in the pocket of your pants, there every time you put them on, always forgotten until the instant your quarters run clattering across the floor," then we can all assume that there must be some truth to this because metaphors work. I think Chabon's unhelpful, politically expedient essay proves Bellow's point, but I was wondering what you thought about it? Specifically, I'm hoping you could flesh out the final two paragraphs of your "Imaginary Jews" piece, all things considered since then. I apologize if this is too fat a question for a comments post, but I would really be interested to hear what you have to say on Chabon's political stance, especially since you've written so well on Bellow and Roth. "Let us not forget the eternal hole in our human pocket," writes Chabon. I won't if he won't. Especially since he has a much larger audience than most of us mere mortals. As a matter of fact, I replied to Chabon’s op-ed “Chosen, Not Special” here. Just as I suspected! My apologies; I hadn't read that far yet. A terrible consequence of seeing primarily through pat political formulations is that it doesn't allow you to do anything more than mix and match them. All those novels for Chabon to do no more than this. "A Jewish ignoramus who trades on his Jewishness," as you so excellently put it, unfortunately for those who don't see it this way, the charge of "subtle" anti-semitism gets applied, such as a recent commmenter at The Elegant Variation did regarding James Wood's review of "The Finkler Question" for Wood expecting what you expect, Professor Myers, that those who love Israel would honor the past and not make a mockery of it. When Wood writes into his margins "I don't believe you" when reading writers like Nicole Krauss too, he's doing so for a very good reason. "...he craves the Jews’ reputation for moral passion; on the other hand, he does not want to be held to account for his own moral cowardice in separating himself from the Jews whenever it suits his self-image to do so." I couldn't agree with you more. Chabon's "Manhood for Amateurs" is an embarrassment too. He doesn't recognize that the need for attention that wrote these essays and compiled them, along with his vile essay this summer, is by nature political. Look, ladies, what an attentive, communicative, downright verbose husband I am that can actually do the dishes too, aren't I someone special? Not like the men of the previous generations who kept households in tact by working hard and saving, but all with such tyrannical modes of silence and reserve. What a joke. The questions you raise with all this fascinates me with writers of the Catholic tradition struggling with their own upbringing. You find this in those like W.G. Sebald whose own parents, which is strictly implicit to his writings, were part of the European disaster that still keeps us puzzled. That wrote his books, and would you look at that, somehow he avoided leading the cheer in the op-ed pages. I agree with R/T's caution; but I know that reading Bellow's letters makes me like him, and reading his novels does the opposite.